The previous scientific explanations have shown that it is the access to the fundamental quantum-mechanical level of nature's functioning and the utilization of the principle of the Field Effect that makes it possible to create coherence and harmony within a system. Maharishi's supreme system of defense precisely applies these findings by utilizing a Field Effect at the most fundamental level of Natural Law—the Unified Field of all the Laws of Nature, as recently discovered by Superstring Theory. The discovery of the Unified Field occurred in several steps. First, progress in quantum physics brought to light that all phenomena in nature can be understood in terms of different, underlying quantum fields. In particular, physicists discovered that all the known, dynamic interactions in nature can be described in terms of four separate fundamental force fields—the force fields of the electromagnetic, weak, strong, and gravitational interactions (see figure below). With progress in unified quantum field theories, however, it was realized that all these different force fields (as well as the different matter fields) are simply different aspects of one single Unified Field of Natural Law, the holistic transcendental field underlying all manifest phenomena found in Nature (see figure below). This complete unification of all the different quantum fields—as described in Superstring Theory—has the most fundamental implication that the Unified Field is a purely self-interacting field. All phenomena in nature are generated sequentially from the modes of the self-interacting or self-referral dynamics of the Unified Field. The property of pure self-interaction of the Unified Field can be seen from the Lagrangian of Superstring Field Theory depicted below. Non-perturbative field theory of the string is a very advanced topic which is still under development. In particular a sufficiently satisfying characterization of certain mathematical operations (like 'multiplication' of the string field and gauge fixing) that is necessary for a rigorous mathematical analysis of the Lagrangian of String Field Theory has so far been given only for specific versions of String Field Theory, such as Witten's Open Bosonic String Field Theory and for the Closed Bosonic String Field Theory—a theory which has been considered by F. Englert, H. Nicolai and A. Schellekens as a candidate for a fundamental Unified Field Theory from which they 'derived' the Heterotic Superstring Theory via E8 x E8 lattice compactification. This means that the above formula for the Lagrangian represents a highly symbolic form. For this reason one still uses mainly Polyakov's perturbative formulation of Superstring Theory which gives precise meaning to the above symbolic formula in the perturbative regime. This is, however, enough to derive the property of pure self-interaction. The formula below with the corresponding diagrams for perturbative Superstring Theory shows very clearly how the property of self-interaction expresses itself in an infinite series of loop diagrams in which the superstring refers back onto itself. Further important aspects of this property of self-interaction are discussed in the double-sided chart "The Self-Referral, Self-Interacting Dynamic Structure of the Unified Field of All the Law of Nature: The Invincible Basis of Nature's Functioning." Moreover, a detailed analysis of the mathematical expressions of Unified Field Theory reveals further remarkable properties of the Unified Field. 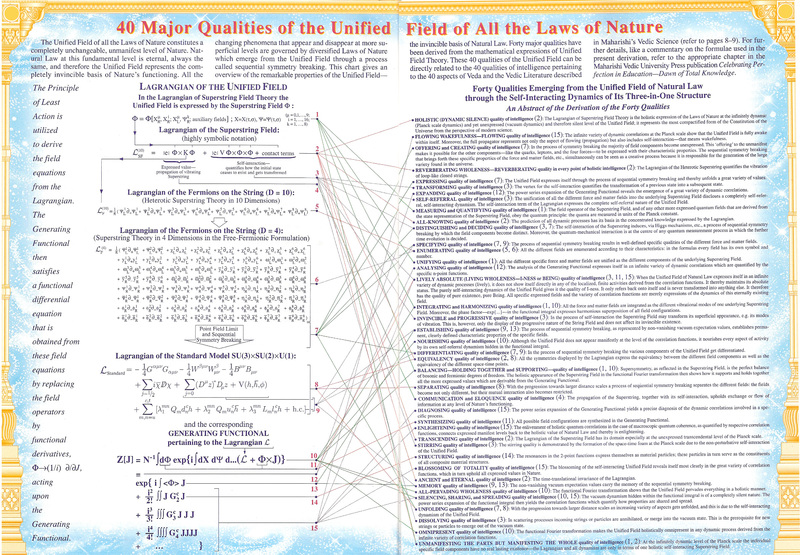 The derivation of 40 qualities is indicated on the chart "40 Major Qualities of the Unified Field of All the Laws of Nature." The discovery that the Unified Field is a field of complete self-referral dynamism at the basis of nature's functioning gives rise to a new, unified understanding of the fundamentals of creation. Since self-referral is the characteristic quality of consciousness, and since the Unified Field of Natural Law is a completely self-referral field, it is natural to conclude that the unmanifest, quantum-mechanical Unified Field of Natural Law (*see note below) is identical with the field of consciousness in its pure, self-referral state. The self-referral state of consciousness, Transcendental Consciousness, or pure consciousness, is a state in which consciousness knows itself in a completely self-sufficient manner; consciousness is its own subject, its own object, and its own subject-object relationship. *Note: a more detailed elaboration of advanced aspects in quantum cosmology that substantiate this important identification of the unmanifest, quantum-mechanical Unified Field as the field of pure consciousness is contained in the chart, "40 Major Qualities of the Unified Field of All the Laws of Nature."